"Kikkoman Panko Bread Crumbs put the crunch into your French toast." Beat eggs together with milk, sugar and Vanilla extract in shallow bowl until well blended. Place panko in pie pan or shallow dish. Dip each bread slice into egg mixture, thoroughly coating both sides; then coat both sides of bread slices with bread crumbs. Place on large wire rack. Add butter and oil into 17-1/4 x 11-1/2-inch jellyroll pan. Place pan in 400 degrees F. oven 1 to 2 minutes, or until butter melts. Remove pan from oven. Place bread slices into pan, in single layer, turning over once to coat both sides of bread slices with butter mixture. Return to oven and bake 15 minutes. Turn bread slices over and bake 10 minutes longer, or until golden brown. the breading wasn't bad, but i like french toast much better without it. We used the homemade sanfransisco sourdough bread that is also on this site and the french toast was better than any resturant I have ever eaten at delicious! Delicious! Very crunchy and flavorful. They were a bit greasy though, so I'll cut down on the oil next time or not use it at all. Yum! I didn't have the bread crumbs that were called for, so I used my white bread crumbs. They worked great, nice and crunchy. This is good. For a little different flavor, instead of the panko try Cap'n Crunch crumbs. Thanks for the recipe. I used cornflakes and sprinkled them with cinnamon sugar. Awesome. 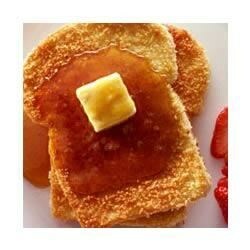 My kids loved this french toast. I added cinnamon to the egg mixture. I will definatley make this again, just not that often because it is so high in calories ;) Great weekend treat!